This past week I got to work with Robonaut 2 again (me working one of the R2 Ops). We got to pull out his taskboard, and though it was not the first time he had used it, it was the first time we used Task Panel B. The task panel is what we’re usign to teach him how to use different types of knobs and switches, so that when he’s able to move about freely inside and outside the space station, he will understand how to utilize the different buttons and knobs. It makes me think of the mobiles you put in baby cribs. 🙂 Here’s a prety cool video out there of him using Task Panel A the last time we did ops: R2 Operating a taskboard on the ISS. 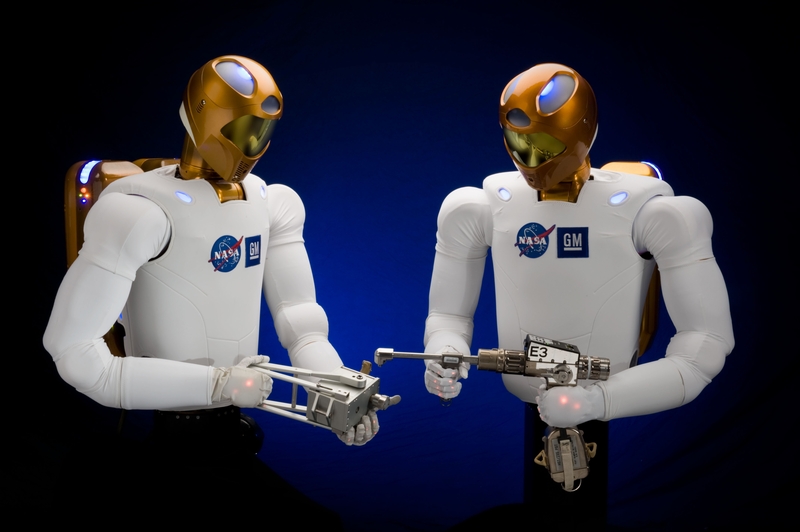 In the back ground, a team of PLUTO flight controllers and Robonaut engineers work together to drive his hands to the right places and calibrate the robot to operate with the taskboard in space. The Robonauts we’ve learned how to use on the ground are of course calibrated for 1G (standard Earth gravity), and it is not a simple thing to teach the robot to now work in microgravity. You’d be surprised by all of the little subtle things that change without the complex effects of gravity on each of his individual motors and limbs. As we drive the robot to these different places, the robot is learning. He has a very complicated vision set of 4 cameras that can pick out and recognize tools, and he will eventually be able to use things like drills, wrenches, etc. In addition to the cameras, he has an infrared sensor that allows him to judge distance. When he is fully calibrated for space and gets his legs some time next year, he’ll be able to freely move around the ISS and go out on EVAs (extravehicular activities, i.e. spacewalks) and judge for himself where things are. It never ceases to amaze me how blind I can be to my own typos, even when I am expecting at least some to be there. I wrote it to sound and be a certain way, so that little voice inside of my head reads it for me that way regardless of what I attempted to write on the paper. This is one of many reasons that, as a writer, I’ve come to learn the value of peer reviews. Not only do other people catch mistakes and logic loop holes that I might never see, but they help contribute ideas and ask questions that I might have overlooked or taken for granted. This is a big part of why I have been workshopping my book in a writer’s group.So what’s in a good writer’s group? Well, for starters, serious writers who are at about the same stage in their book writing process as you are. It would be hard for someone just starting fresh to join a professional group, or for someone who only writes for fun to try and join a group that was all about getting down to business. You will need consistent membership, and probably want at least one person to be from your own genre. While there are lots of good ideas and great feedback a romance author could get from a horror writer and vice versa, they’re not going to be as interested and knowledgeable about the subject matter as someone in the same genre. Variety, however, is still of key importance since those other POVs (points of view) will make you think on a deeper level and add depth and complexity to your story that you may not have expected or planned for. Small membership is also ideal, at least in my case, because time is fleeting and precious. You want to make sure that you can balance your group with your life, and that you will have time to dedicate equal attention to all members of your group. Our group has four members that are active all the time, and one or two that pop in on occasion. Consistent scheduling will help with the time factor, too. We aim to meet once a month on a day we’ve agreed on as a group works out for us. We chose Sunday so that the procrastinators can have time to scramble together last minute words, and the busy people will get Saturday to read everyone’s submissions. We also limit ourselves to 25 page submissions, and schedule “special” sessions months in advance for completed novels to give people plenty of time to review. There are a few key things to keep in mind while participating in a group. First and foremost, if you’re not having fun, or you feel like everyone else is benefiting from your insight, but you are not benefiting from theirs, start looking for a new group. You also need to remember to keep writing beyond group or you’ll never get done. Professional writers do a chapter a week, sometimes even in a day when they get in a roll. If you do a chapter a month it will take you two years to get those 24 chapters you were aiming for, or perhaps even longer if you decide to resubmit something. Work life and family balance should never be second place, so don’t go to extremes to get done, but keep up the pace and always strive to be a chapter or two a head of the group. That way even if you miss a month of writing, you won’t miss a month of reviewing. Remember to keep your criticism constructive. Sometimes people get stuck or end up on paths that they had not planned on, and it is more helpful for you to provide ideas and guidance than for you to just tell them you don’t like something without explanation or examples of ways you think their writing can improve. There are many plot twists and direction changes that my own book has taken since participating in writer’s group that have caused me to scrap summaries and skew off on cool tangents that I had not thought of before. And, the further I get in my novel, the more ideas I have come up with for the master plot that I can weave back through. Almost all of this came from group members pointing out things they did not like, people being OOC (out of character), or members providing me with alternative solutions to problems and asking questions that make you think. Remember that the first novel is the hardest, and planning doesn’t always work out. You’ll get there, it just takes time, and you have to be willing to make the time. Go ahead and just get through it. I promise you it is a lot easier to pick that title, find that opening line, and look for that missing plot scenario when you’re done than it is to obsess over the same chapter for months. Most of all, have fun and be yourself. Writing is an extension of yourself, and people will judge you for it, but try not to let that rule everything you do.